Begin your journey together with your partner with a beach wedding in exotic Goa. We assure moments of undiluted joy & fulfillment and a lifetime of thrilling memories. 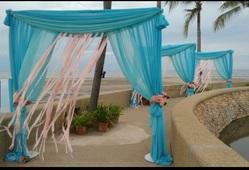 Beach weddings are the most sought after theme in the Goa wedding scene. Relying on our expertise in this business, we are specialized in providing Beach Wedding Service to our esteemed customers. These Beach Wedding Services are rendered with the help of our expert team members who will manage all activities on your behalf. We execute these services at most economical prices. We, as professional celebration planners, let you simply enjoy the occasion whilst taking over the business of organization. Hotel Ashwamedha Residency is the perfect place for you to have your dream wedding. You can avail services like photography, decoration, music, videography etc. using our dedicated service partners. Planning and executing weddings were never so easy. All you have to do is to drop in, and we will help you organise and customise your wedding just like you have always wanted. Today, many busy couples find that they are rushed for time and short on cash when comes to planning and financing their wedding. Beach weddings offer a sensible yet elegant solution to the expense and headache normally associated with a traditional wedding. Weddings have taken a new flight in today's world. Today there is destination wedding and beach wedding is one of the most preferred styles of marriage. The tranquil sea and the zephyr blowing is the perfect backdrop for a pure and auspicious occasion like marriage.